The debate is fierce, bitter, and as old second wave feminism: Do trans women experience male privilege? 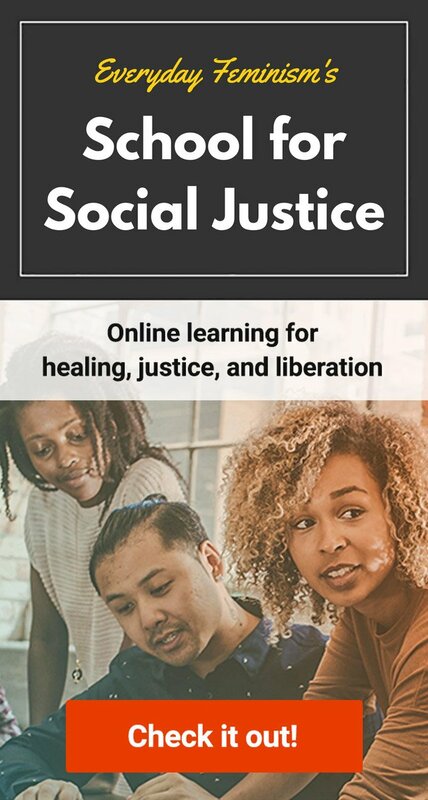 Meaning, do trans women receive, at the expense of cis women, much-needed resources from both within and outside of feminist movements? This argument forms the basis of the exclusion of trans women not only from feminist activism, but also from female-only spaces in general, such as bathrooms and domestic violence shelters. The idea is that trans women, with our “masculine” bodies and having been “raised as male,” receive all kinds of privilege that cis women don’t, such as relative safety from sexual harassment, social preference in school and the job market, and so on. As a result of this perspective, trans women are often excluded from women-only spaces on the basis that we might be violent, or make cis women uncomfortable, or that we are already served by male institutions. Some well-known feminist writers even go so far as to say that trans women also exhibit male entitlement by stealing the spotlight from and “redefining”cis women’s struggles. This kind of reasoning is famously associated with the TERF (trans-exclusionary radical feminist) movement. However, it also pervades many mainstream women’s organizations and institutions. It’s a complex issue, and I can understand why some cis women might think this way (although it kind of stings, to be honest). Heck, even some trans women have publicly agreed that we receive male privilege from society, particularly those of us who are pre-transition or non-transitioning. There is room at the feminist table for all of us. But the concept of trans women having male privilege has really damaging and violent repercussions: Because of it, we are excluded from women’s shelters and told to go to men’s centers instead, where we are exposed to enormous sexual violence. If incarcerated, we are put in men’s prisons, to face even more of that sexual violence. Organizations dedicated to fighting for the rights of women will not represent us – or worse, openly attack us – leaving us unrepresented, with nowhere to turn. I believe that solidarity between all women is possible and very necessary. To do that, we have start recognizing that trans women’s experiences of misogyny are just as “real” and pervasive as cis women’s and that we do not receive male privilege. There is a simple truth that a lot of folks, even allies (even queer and genderqueer ones! ), tend to forget or misunderstand when thinking about how trans women are affected by privilege/oppression: We are “real” women – as much as any cis woman is. 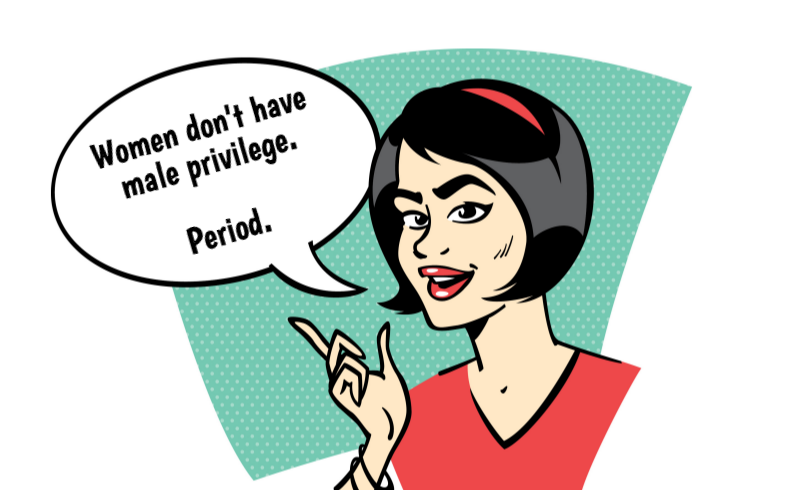 And if we are women, that means we cannot receive male privilege – because male privilege is by definition something that only men and masculine-identified people can experience. To say trans women receive male privilege implies that we are partially male, or less female than cis women, or falsely female. All of the above are incorrect and offensive, because trans women are women. No ifs, no ands, no buts! The idea of trans women being socialized as male is the biggest argument that TERFs bring out when trying to justify the exclusion of trans women from feminism, and is also the most compelling. After all, it’s true that trans women are perceived as male at birth, and we are treated as such. However, most trans feminine children experience being treated as male extremely differently from cisgender boys. Cis boys generally do not question or feel discomfort with the way that society treats them. They are able to accept and enjoy their privilege, usually without even noticing it. Being called boys, for them, is not accompanied by fear, self-doubt, or the feeling that there is something deeply fundamentally wrong with them. Young trans girls, on the other hand, tend to experience being treated as male as disorienting and terrifying, because it teaches us that our identities are revolting to society. Male socialization, for us, is actually a coded message: You’re not who you think you are. If you try to be anything other than what we say, you’ll be punished. Let me make an analogy: Imagine that you are born with dark hair, but everyone you know – from your parents to your teacher to your friends – tells you that you are blond, starting from the moment of your birth. As you grow up, you can see that your hair is the same color as other dark-haired people, but the people around you insist on giving you compliments for being blond. And every time you say that you think you might actually be brunette, you’re beat up, told that you’re mentally ill and immoral, and subjected to experimental medical procedures designed to “fix” you. What would that do to your sense of self? How enjoyable would that be? Now apply that analogy to gender identity, which is to say, every aspect of social life. If this analogy reminds you of gaslighting (an abuse tactic that works by denying the victim’s perceptions of reality), then you are right on track. Trans women are, from childhood, subjected to a form of emotional abuse that is carried out by an entire society – which might explain why we are vastly more likely to struggle with PTSD, anxiety, and depression. So here’s a confession: When I was little and everyone thought I was a boy, I didn’t just love Barbie. I wanted to be Barbie (there are all kinds of internalized racism and fatphobia that went into this). This is common enough experience among children of the 80s and 90s – all the other little girls I knew wanted the same thing. But every time I picked up or even looked at a Barbie, I was called “fag” or “gaylord” (this was the 90s!) by the other boys, reprimanded by my teachers, and punished by my parents. I was often singled out for bullying by other children and for abuse by adults, because I was perceived as feminine, and therefore an object of entertainment and exploitation. From this, I learned – as all girls do – that to be a girl is to be a child of a lesser god in this society. I learned that girls were weak, stupid, frivolous, unimportant, unnecessary. And I, of course, was a girl. Even if no one would admit it. What I mean to illustrate with this is that trans women experience misogyny, even before we begin presenting or being read as women in society. We receive the same messages about femininity and girlhood as cis women do, and we understand them to be about ourselves – however hidden those selves might be. But! I can already the TERFs crying out, Trans women who are read as male are safer from street harassment and sexual assault! Trans women who are read as male receive preferential treatment in school and employment! This is actually not at all true. Trans women are one of the groups most likely to be discriminated against in the job market, housing, healthcare, social services, and pretty much every other field. And from personal experience, I can certainly tell you that we are not safer from harassment or assault. Actually, any person paying attention to the news should know that. At a certain point in my life, it was true that if I really, really wanted to, I could put on “boy” clothes when I went out into the world and get read as male. I used to think of this as male privilege, because I could “opt out” of being street harassed, though at the cost of being misgendered. Then I realized that this is kind of like telling women that they would be safer if they would only wear conservative clothing. It’s saying that I could trade my freedom and identity for safety. In any case, this is something that I now cannot do. Having physically and medically transitioned, as many trans women do in some way or other, it doesn’t matter what I wear. I will still be harassed just as much. A friend of mine was once involved in a nasty Facebook flame war that lasted for several days. In it, some people were saying that because she is a “butch” trans woman and doesn’t pass as cis, she experiences more gender privilege than “femme” trans women. As a femme trans woman who passes a lot of the time, I feel the need to stand in solidarity with all my trans sisters and state first of all that “butch” is an identity (originating from the lesbian community) that people can choose to identify with or not. It is not necessarily the same thing as being a non-passing or pre-transition trans woman. And if anything, trans women who can’t or don’t pass as cis women are even more likely to experience danger and discrimination than those of us who do, because they are more visibly marked as deviant in mainstream culture. They are more likely to be read as men who are “betraying” masculinity or as “bad” female impersonators. Claiming that some trans women are more masculine than others because of the way they look or dress is very similar to saying that “real” women have to shave their legs and wear makeup. It reinforces the policing of women’s bodies and excludes many women from the conversation about what womanhood means to them. None of the above exempts or excuses trans women from participating in misogyny. We are just as capable as anyone else of shaming and gender policing other women. This is because trans women are exposed to so much cultural misogyny and patriarchy that we inevitably end up internalizing it – sometimes we even make conscious decisions to uphold patriarchy so that we can better fit in with the rest of society. News flash: Cis women do the very same things. Women – all women – have to struggle to survive and thrive in a male-dominated world. Sometimes we make ugly choices and swallow harmful ideas because it seems that there is no other option. So trans women aren’t off the hook for perpetuating misogyny – but when we do so, that doesn’t make us any less “real” as women. There is a very vocal community of cis folks who are, for whatever reason, highly invested in talking about and criticizing trans women’s experiences. Many, many cis academics and media-makers have spent a lot of time writing articles, books, and films about what they think we are. But in the end, it is not up to cisgender people to define trans women and our lives. It isn’t up to cis feminists to tell us when we may or may not call ourselves women. Trans women are entitled to the right to decide for ourselves what we believe and who we are, even when it is complicated, even when we disagree. And isn’t self-determination, even in the midst of a complicated and violent world, the point of feminism? Trans women have so much to offer the feminist movement: our entire history, our whole lives, are stories of struggle and resilience. We deserve to tell those stories – and cis women deserve to hear them. We have more in common than we think. And there truly is room for all of us at the table.